Visitors should enter the park through the large gates facing 28th Street. Tickets sold until 4:30 p.m.
Current Friends of Sutter’s Fort Members receive free admission. Admission fees are per person, and visitors may navigate Sutter’s Fort at their own pace. Please Note: On special interpretive program days fees are $7 for adults and $5 for youth. Sutter’s Fort State Historic Park is a popular destination for both educational and commercial tour groups. In order to guarantee a space for a tour of 10 or more people, school tours and other group tours must have a confirmed reservation. Please contact California State Park staff member Angela Howell at angela.howell@parks.ca.gov or call her at 916-445-3755 for more information. Sutter’s Fort State Historic Park does not have its own parking lot. Metered city parking is available, and there are several public parking lots in the vicinity. Bus Parking: Free bus parking is available on “L” Street in front of Sutter’s Fort. Public Transportation is also an option, please check with Sacramento Regional Transit. Our friends at the Midtown Association are a great resource for more information about parking, public transportation and biking options in Midtown, Sacramento. Please visit their Getting Around web page for detailed information including maps. Visitors to Sutter’s Fort State Historic Park are welcome to explore the historic structures and living history museum at their own pace. A map and brochure is available at the kiosk, an audio tour is available in in English, German, Japanese and Spanish. A written tour is also available on request. During the school year, you may arrive during one of our many educational programs, which allows you the unique opportunity of observing students in historic costume engaging in hands-on-learning activities throughout Sutter’s Fort State Historic Park. Many visitors prefer to visiting during an Environmental Living Program or Environmental Studies Program because it enhances the visitor experience. On days when educational programs are not in session, you may encounter our experienced docent volunteers as your make your way through Sutter’s Fort. They are happy to provide background on what you are seeing, and tell you more about history of Sutter’s Fort and the people who lived and worked here. In addition, many visitors enjoy participating in our Sutter’s Fort scavenger hunt, which provides an opportunity to search for artifacts and historical information to answer a page of questions. The scavenger hunt is available at the kiosk, and is appropriate for all ages. Personal photography is welcome throughout Sutter’s Fort State Historic Park. Commercial photography must be approved in advance by California State Parks. We also encourage visitors to explore the exterior grounds of Sutter’s Fort, and to visit our neighbors at the State Indian Museum. Sutter’s Fort is located in the heart of Midtown Sacramento’s Sutter District, which is home to dozens of outstanding restaurants and shops- many within walking distance. For more information, please visit the Midtown Association’s website. The Friends of Sutter’s Fort is proud to be the nonprofit 501c3 cooperating association for Sutter’s Fort State Historic Park. We support the staff, programs and historic preservation efforts at Sutter’s Fort and operate the Trade Store, but we do not operate the park or programs, nor do we set the fees or park policies. For more information, please see the Sutter’s Fort State Historic Park website, operated by California State Parks. 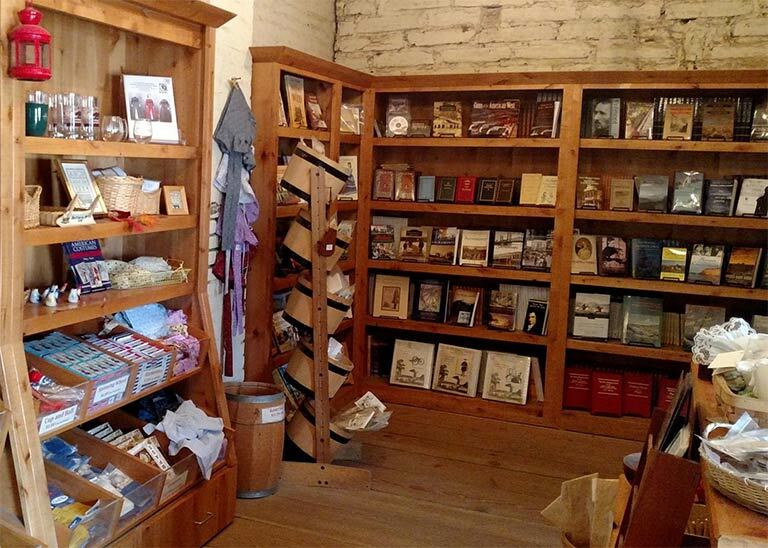 Be sure to visit the Gift & Trade Store located inside Sutter’s Fort, which is operated by Friends of Sutter’s Fort. Open Daily from 10 a.m. to 4:30 p.m.
We are proud to offer a carefully curated selection of books, collectibles and craft kits that are related to the history of Sutter’s Fort State Historic Park. All Trade Store sales go right back into supporting the educational programming and historic preservation of Sutter’s Fort State Historic Park.